as we owing to trece saturday in form of one primicia edgar croes of 45 year, that owing to become victima seriamente of one atraco at tanki leendert owing to wordo take away cu urgencia for bogota, colombia. this after cu doctor owing to constata cu his situation have to of atencion medico more avanza. police seems not have complaint entrega, because the victima self will have to haci this according the family owing to splica we. 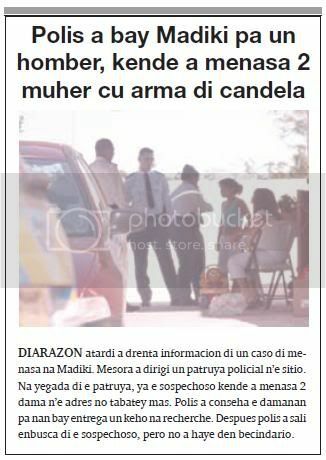 diabierna night the caso here owing to sosode, cu owing to place cu police the instant ey owing to dicidi of bay check at marriott where the victima is work for know of his family. the victima will was baby y is a cu is cla for enfrenta cualkier problem. bisiñanan where the caso owing to sosode owing to tell cu the victima owing to wordo beat by of 3 person hour cu past owing to reclamanan on algo. owing to dale cu tree in cabez. on the photograph self can see one bit of the form cu owing to come across cu edgar croes. family owing to despedi of dje although the was in coma first cu past owing to leave for bogota abordo of the air ambulance of aruba. will see kico police will bay haci for cu the caso earnest here close of the cas of family therefore. 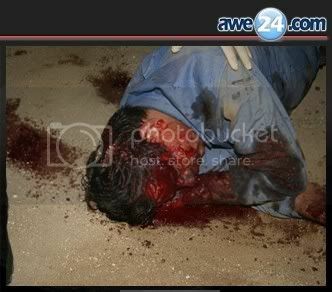 at tanki leendert where have one victima now cu craneo fractura. in news of police of yesterday, mucho not owing to being divulga of the caso, y owing to limita at tell cu police of north is bay diabierna night 8.45 on the caminda at tanki leendert, where have one person injury, on caminda cu one chop serious at his forehead. hour cu police owing to arrive they're come across cu one man dress cu uniform of one highrise hotel, is bleed pisa at his forehead y had one chop enough hundo. 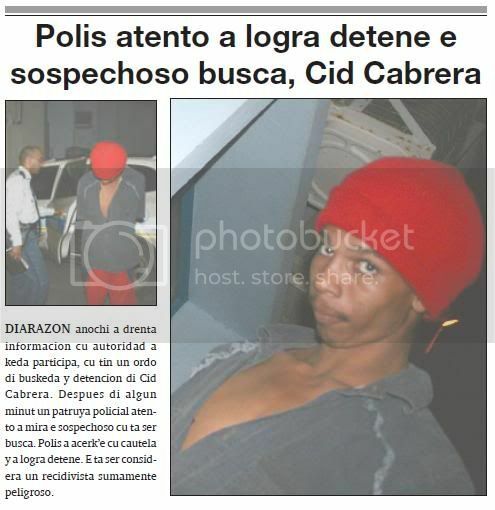 in his saco, police owing to achieve one notebook cu the name edgar croes. the self not can owing to tell nothing kico owing to happen cune. ambulance owing to transporte for poli for tratamento. 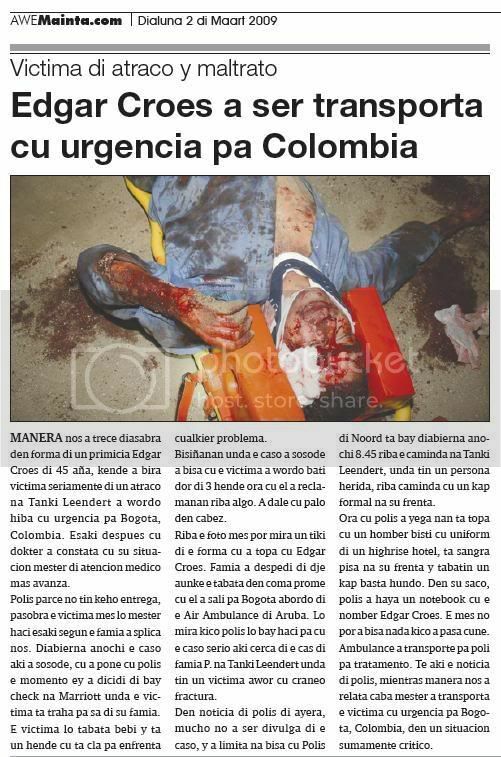 till here the news of police, while as we owing to relata end have to owing to transporta the victima cu urgencia for bogota, colombia, in one situation extremely critico. 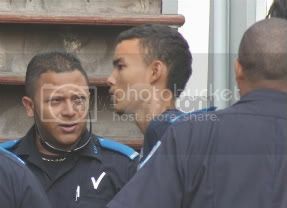 detencion of dennis oduber owing to stay prolonga tuesday but int owing to on account of aparece fast of huez comisario the conocido comerciante dennis oduber relaciona cu acusacion of extorsion y menasa. after of owing to revisa all documento huez comisario owing to dicidi of prolonga detencion of the comerciante, same also of the socio in extorsion, the dominicano c.t. 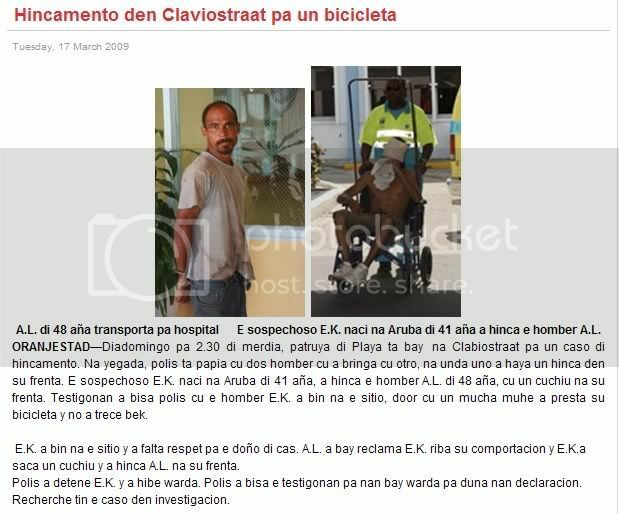 relaciona cu reciente publicacionnan in prensa, tocante menasanan earnest in direccion of family of the conocido advocate, the fayecido mr. john van der kuyp, in name of family, advocate mr, edwin duijneveld owing to emiti one declaracion. the declaracion is tell will next y we of awemainta is place literalmente: “den the period of 27 of feburary till cu 12 of march, at various ocasión family van der kuyp owing to achieve menasanan earnest, at una one supuesto are colombiano is exigi cada trip one suma of coin. this según the criminalnan will was owe cu mr. john van der kuyp owing to let atrás day cu past owing to fayece. mirando the gravedad of the menasanan here, police owing to conseha family van der kuyp for they not stay live in they more, while the caso not wordo soluciona.famia van der kuyp is desmenti strongly cu they casa y father mr. john van der kuyp (q.e.p.d.) owing to let cualkier owe of the magnitud cu owing to wordo menciona in prensa atrás, or cu the had contacto cu low world.tur person cu owing to conoce mr. john van der kuyp know mihor. at same instant family van der kuyp is gradici everybody, cu at one or another as owing to give they sosten in the dianan dificil, cu thanks god now is behind lomba”.te here the declaracion of family van der kuyp, relaciona cu publicacion y menasanan of ultimo dianan, for cual till cu yesterday have two person deteni, cu is one dominicano, c.t. 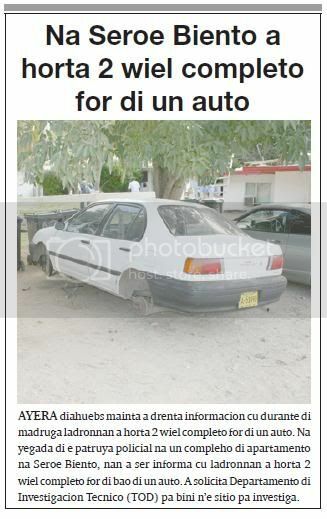 y the aruban, dennis oduber. investigacion will determina con far they're envolvi y that more is behind the extorsion here. 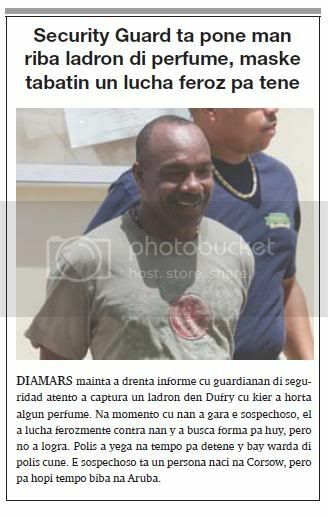 tuesday morning owing to enter informe cu guardianan of seguridad attentive owing to captura one thief in dufry cu wanted owing to steal some perfume. at instant cu they owing to grab the sospechoso, past owing to struggle ferozmente contra they y owing to busca form for huy, but not owing to succeed. police owing to arrive at time for detene y bay keep of police cune. the sospechoso is one person naci at corsow, but for much time live at aruba. tuesday night owing to enter informacion cu ladronnan owing to break enter one cas at san fuego y owing to steal several articulo of value. at once owing to dirigi one patrol policial n’e sitio, owing to come resulta cu the anti-socialnan owing to break y forza the door of cushina for enter. they owing to bay cu the.o. one plasma flat screen of 42 inch, one computer cu they not owing to end of pay full y several another articulo aparte of owing to reboltea full the cas. 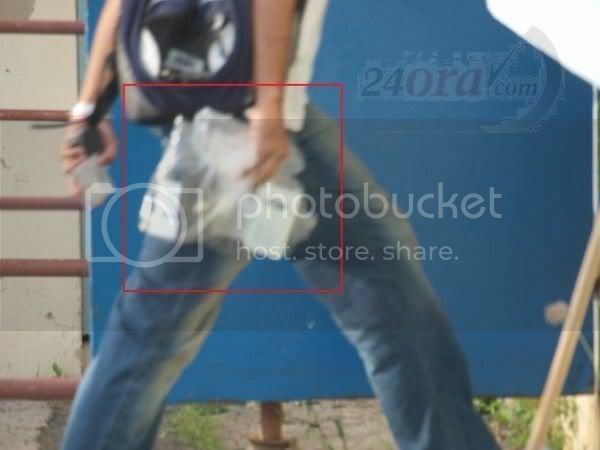 according the doñonan of cas, this is of 5 trip cu they're break enter in the same cas in corto time. the family is all desespera cu the situation at aruba cu tanto hortamento. during tratamento of the caso penal contra the sospechoso of ladronicia albert solognier, his advocate mr. falconi owing to tell huez cu past owing to wordo informa cu in kia is circula more drugs cu on caya. 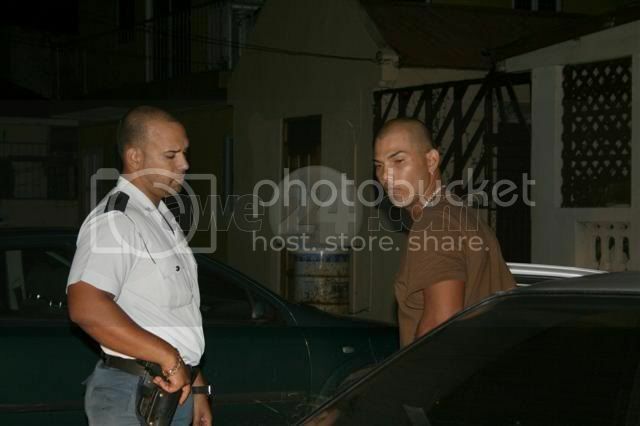 solognier is wordo sospecha cu day 15 of january 2009, past owing to steal for of one car at san nicolas. one agent of police at civil owing to core his slow y owing to succeed detene. albert solognier that was on one bicycle owing to happen hand for one cooling bag cu had in one car, but not owing to arrive mucho far. según albert solognier, the had hungry y was core cu bicycle of his brother. past owing to see on asiento behind the car one bag roos y owing to dicidi of bay cu this. past owing to tell huez cu past owing to hinca hand by of one window cu was one some open y owing to open the door. the hour ey the alarma owing to activa y one rato after past owing to wordo deteni. huez owing to señala cu solognier barely owing to leave for of kia past owing to go back cay close. past owing to remarca cu solognier owing to comete the delito here during his time of proof. albert solognier owing to tell huez cu the is one adicto on base y cu past owing to solicita at centro colorado but still not owing to stay cla. fiscal is achieve solognier culpable of ladronicia y mirando the mature cu the is one recidivista, past owing to exigi 4 month of jail. 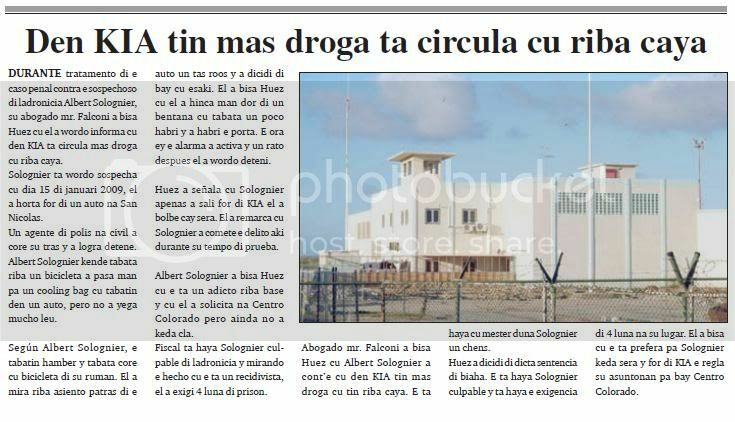 advocate mr. falconi owing to tell huez cu albert solognier owing to cont’e cu in kia have more drugs cu have on caya. the is achieve cu have to give solognier one chens. huez owing to dicidi of dicta sentencia of trip. the is achieve solognier culpable y is achieve the exigencia of 4 month at his lugar. past owing to tell cu the is prefera for solognier stay close y for of kia the regulation his asuntonan for bay centro colorado. 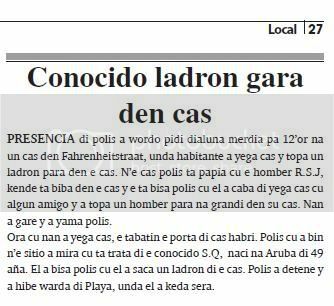 conocido thief grab in cas presencia of police owing to wordo ask monday afternoon for 12’or at one cas in fahrenheitstraat, where inhabitant owing to arrive cas y come across one thief stop in the cas. n’e cas police is talk cu he r.s.j, that live in the cas y the is tell police cu past owing to end of arrive cas cu some amigo y owing to come across one man stop at big in his cas. they owing to gare y owing to calling police. hour cu they owing to arrive cas, the had the door of cas open. 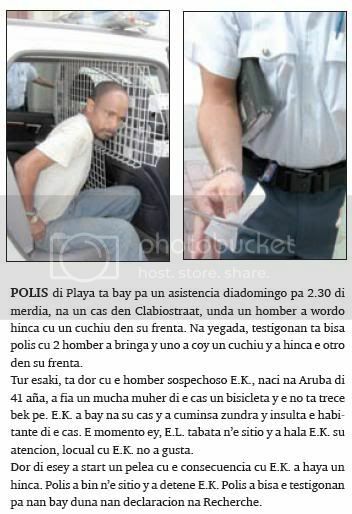 police cu owing to come n’e sitio owing to see cu is deal of the conocido s.q, naci at aruba of 49 year. past owing to tell police cu past owing to saca one thief of the cas. police owing to detene y owing to hibe keep of beach, where past owing to stay close. tuesday night, near of 9.15, he h.w. naci at aruba of 48 year, owing to bay keep of police at north, y is count ; police locual cu owing to pase near of marriott hotel. the is tell cu the was coriendo y owing to come across cu one car gehuur, maneha for one tourist, for cual car the have to owing to brake for evita one choke serious. past owing to tell police cu the have to owing to brake p’e not owing to strike in one v car. 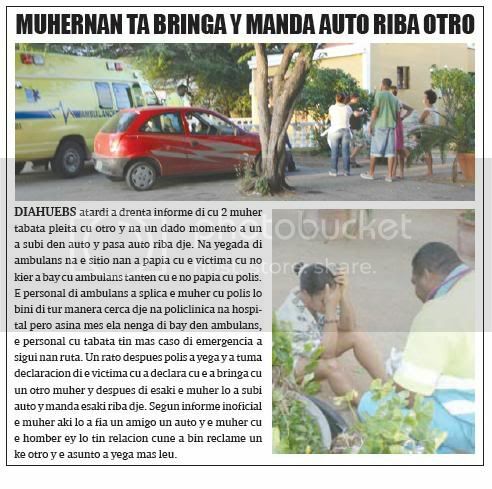 according his declaracion in the car had 4 tourist, kendenan owing to descend for of the car y owing to menase. one of the turistanan owing to pushe, while cu one tourist muher owing to dale cu slof in his cara. h.w.a tell police cu past owing to angry y owing to push the tourist bente bao. for evita more confrontacion, past owing to lever his car y owing to come keep. more late, the manager of the hotel owing to calling police y the tell cu the turistanan is bay keep of police his day after for give complaint of maltrato contra h.w. tuesday night, 12.20, he b.g. naci at the netherlands of 37 year owing to bay keep of police at north y is haci denuncia of ladronisia for of his apartment at paw-paw. 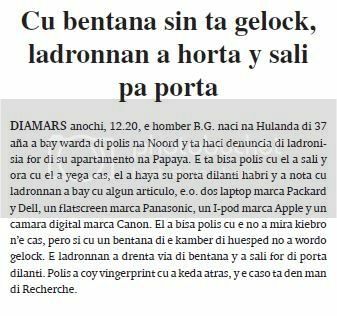 the is tell police cu past owing to leave y hour cu past owing to arrive cas, past owing to achieve his door fast open y owing to notice cu ladronnan owing to bay cu some articulo, the.o. two laptop mark packard y dell, one flatscreen mark panasonic, one i-pod mark apple y one camara digital mark canon. past owing to tell police cu the not owing to see kiebro n’e cas, but if cu one window of the bedroom of huesped not owing to wordo gelock. the ladronnan owing to enter via of window y owing to leave for of door fast. 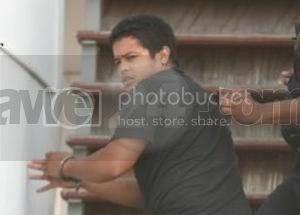 police owing to coy vingerprint cu owing to stay behind, y the caso is in hand of recherche. ORANGE CITY - By Maiky Faro, main suspect in embezzlement of millions florin of the Land Laboratory, the prosecutor demanded eight years in prison. The officer has accomplices Yolanda Vrolijk and Jacqueline Geerman respectively four and three years imprisonment demanded. Merry may Geerman and five years for public works. Faro is in the retirement age. The judge is ruling on April 3 leading in this case. Depending on what the court decided, would cheerful and Geerman, now at large again in the cell should. 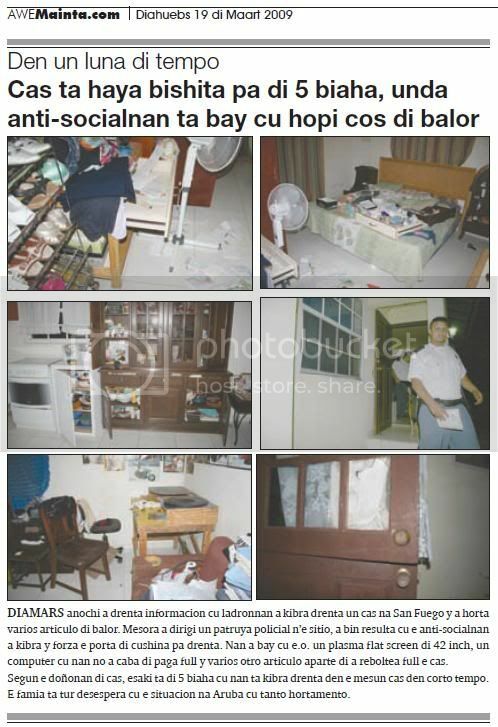 The public demanded a high prison for Faro based because he considered that this proven ten million florin has darkened and he shows no remorse for what he did. As the head office of the Land Laboratory, the main suspect decade falsified invoices and purchase orders of an existing company in the United States (U.S.) of which he was director. The officer has an accomplice Geerman 32 checks in the U.S. which they collected 455,000 florin has gathered. There is evidence that significant amounts of money they have paid into the bank account of her child, and that its power has grown since 2002 with more than 300,000 florin. Merry between 2002 and 2007 a total of 232,000 florin received on its behalf. The officer believes that it is not the truth in order to obtain the money to talk. During the treatment of the fraud, the prosecutor argued that rumors were circulating on the financing of the election of political party MEP by Faro prime suspect in the fraud money. According to the officer, these are false rumors because research has shown that this is not true. From that research has shown that Faro a large part of the millions he lost in a decade, has spent. diahuebs nightfall owing to enter informe of cu 2 muher was quarrel cu another y at one dado instant owing to one owing to lever in car y happen car on dje. at arrival of ambulance at the sitio they owing to talk cu the victima cu does not owing to bay cu ambulance adieu cu the not talk cu police. the personal of ambulance owing to splica the muher cu police will come of all as close dje at policlinica at hospital but so self ela deny of bay in ambulance, the personal cu was have more caso of emergencia owing to follow they ruta. one rato after police owing to arrive y did take declaracion of the victima cu owing to declara cu the owing to fight cu one another muher y after of this the muher will owing to lever car y send this on dje. according informe inoficial the muher here will owing to lend one amigo one car y the muher cu he ey will have relacion cune owing to come reclame one want another y the asunto owing to arrive more far. 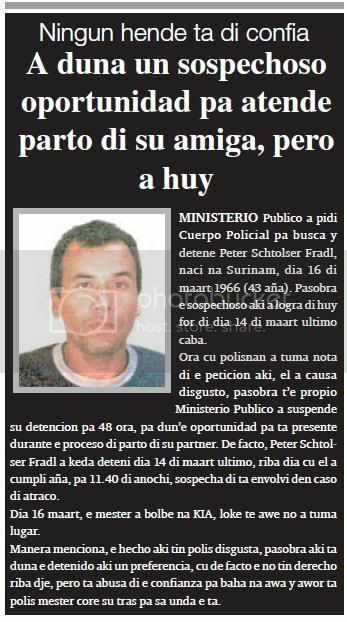 none person is of confia owing to give one sospechoso oportunidad for atende parto of his girlfriend, but owing to huy ministerio publico owing to ask cuerpo policial for busca y detene peter schtolser fradl, naci at surinam, day 16 of march 1966 (43 aña). because the sospechoso here owing to succeed of huy for of day 14 of march ultimo end. hour cu polisnan did take notice of the peticion here, past owing to cause disgust, because t’e own ministerio publico owing to suspende his detencion for 48 hour, for dun’e oportunidad for is present during the proceso of parto of his partner. de facto, peter schtolser fradl owing to stay deteni day 14 of march ultimo, on day cu past owing to accomplish year, for 11.40 of night, sospecha of is envolvi in caso of atraco. day 16 march, the have to owing to go back at kia, thing till today not did take lugar. as menciona, the mature here have police disgusta, because here is give the detenido here one pit, cu de facto the not have derecho on dje, but is abusa of the confianza for descend at water y now is police have to core his slow for know where the is. From my understanding of this article, the vehicle in question was being driven irresponsibly and police unsuccessfully tried to stop the vehicle, and even called for additional assistance to stop the vehicle. 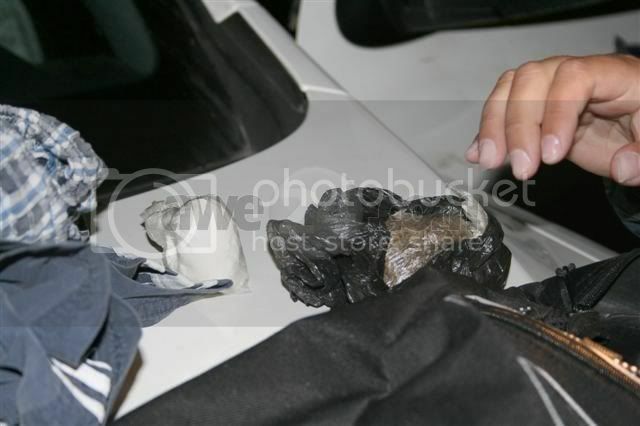 The vehicle eventually stopped at a home where the vehicle and the driver were taken into custody. It seems odd to me that the driver and the others at the home are seen with their faces hidden in the published pictures. Why? 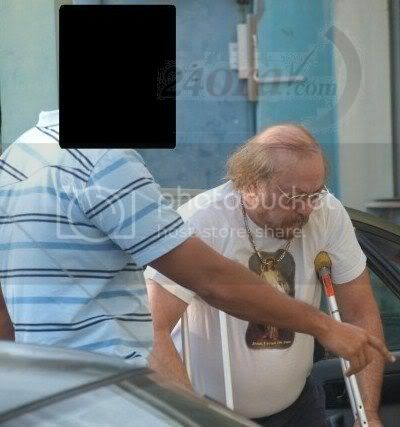 diarazon nightfall late one patrol of santa cruz owing to look at one car coriendo at one form iresponsable on caminda. at once police owing to bay behind the vehiculo here. they owing to place sirena y zwaailicht owing to try several trip for pare but not owing to succeed. owing to ask refuerzo of more patrol policial, but one rato after the chofer of the vehiculo owing to arrive stop at one cas where eynan police owing to bay detene y owing to confisca the vehiculo. 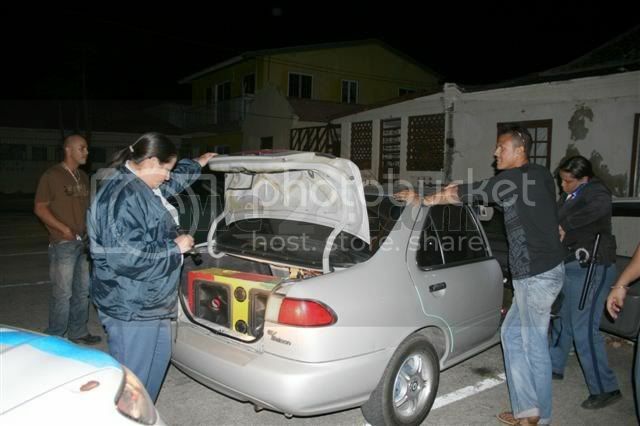 police owing to take away the chofer because; the car for keep of police at santa cruz. 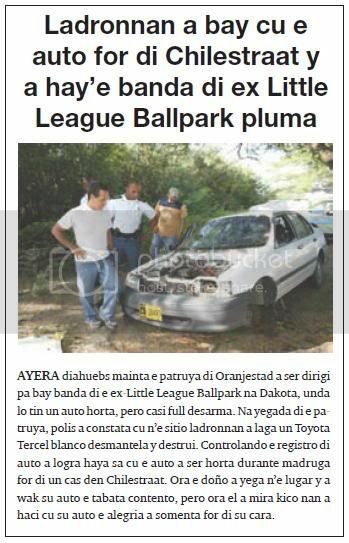 diahuebs morning the patrol of oranjestad owing to being dirigi for bay near of the ex-little league ballpark at dakota, where will have one car steal, but casi full desarma. at arrival of the patrol, police owing to constata cu n’e sitio ladronnan owing to let one toyota tercel blanco desmantela y destrui. controlando the registro of car owing to succeed achieve know cu the car owing to being steal during madruga for of one cas in chilestraat. hour the owner owing to arrive n’e lugar y owing to look at his car the was contento, but hour past owing to see kico they owing to haci cu his car the gladness owing to somenta for of his cara. 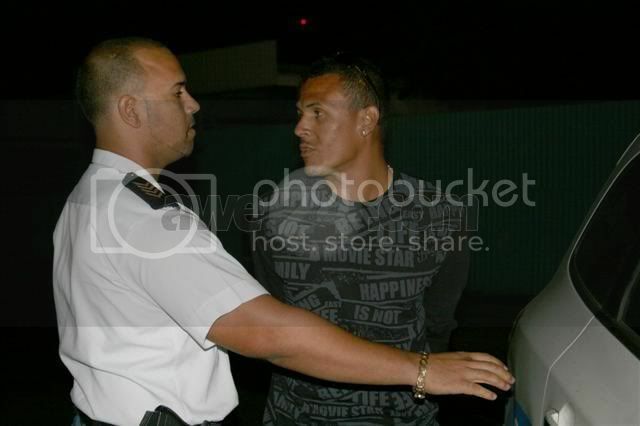 diahuebs morning owing to enter informacion cu during of madruga ladronnan owing to steal 2 wiel completo for of one car. at arrival of the patrol policial at one compleho of apartment at seroe wind, they owing to being informa cu ladronnan owing to steal 2 wiel completo for of bao of one car. owing to solicita departamento of investigacion tecnico (tod) for come n’e sitio for investiga. diarazon night owing to enter informacion cu autoridad owing to stay participa, cu have one ordo of buskeda y detencion of cid cabrera. after of some minut one patrol policial attentive owing to see the sospechoso cu is being busca. police owing to acerk’e cu cautela y owing to succeed detene. the is being considera one recidivista extremely dangerous. diarazon nightfall owing to enter informacion of one caso of menasa at madiki. at once owing to dirigi one patrol policial n’e sitio. at arrival of the patrol, already the sospechoso that owing to menasa 2 lady n’e adres not tabatey more. police owing to conseha the damanan for they bay entrega one complaint at recherche. after police owing to leave enbusca of the sospechoso, but not owing to haye in becindario.